Peptide with sequence C-TKTDPSLENPTH, from the C Terminus of the protein sequence according to NP_003499.1. Small volumes of anti-FZD9 antibody vial(s) may occasionally become entrapped in the seal of the product vial during shipment and storage. If necessary, briefly centrifuge the vial on a tabletop centrifuge to dislodge any liquid in the container`s cap. Certain products may require to ship with dry ice and additional dry ice fee may apply. 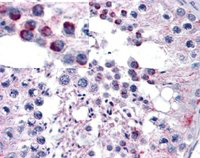 Immunohistochemistry: In paraffin embedded Human Testis shows acrosomal staining of spermatids. Recommended concentration, 5-10ug/ml. Western Blot: Preliminary experiments in Kidney lysates from Human, Mouse and Rat gave no specific signal but low background (at antibody concentration up to 1ug/ml). (5ug/ml) staining of paraffin embedded Human Testis. Steamed antigen retrieval with citrate buffer pH 6, AP-staining. NCBI/Uniprot data below describe general gene information for FZD9. It may not necessarily be applicable to this product. FZD9: Receptor for Wnt proteins. Most of frizzled receptors are coupled to the beta-catenin canonical signaling pathway, which leads to the activation of disheveled proteins, inhibition of GSK- 3 kinase, nuclear accumulation of beta-catenin and activation of Wnt target genes. A second signaling pathway involving PKC and calcium fluxes has been seen for some family members, but it is not yet clear if it represents a distinct pathway or if it can be integrated in the canonical pathway, as PKC seems to be required for Wnt-mediated inactivation of GSK-3 kinase. Both pathways seem to involve interactions with G-proteins. May be involved in transduction and intercellular transmission of polarity information during tissue morphogenesis and/or in differentiated tissues. Belongs to the G-protein coupled receptor Fz/Smo family. 1. The presence of nanog, Oct-4, SSEA-1, and SSEA-4 suggests that periodontal ligament mesenchymal stem cells are less differentiated than bone marrow-derived MSCs, and the frizzled-9/Wnt pathway is important in proliferation and differentiation.